In-situ monazite Th–U–total Pb dating and zircon LA–ICP–MS depth-profiling was applied to metasedimentary rocks from the Vaimok Lens in the Seve Nappe Complex (SNC), Scandinavian Caledonides. 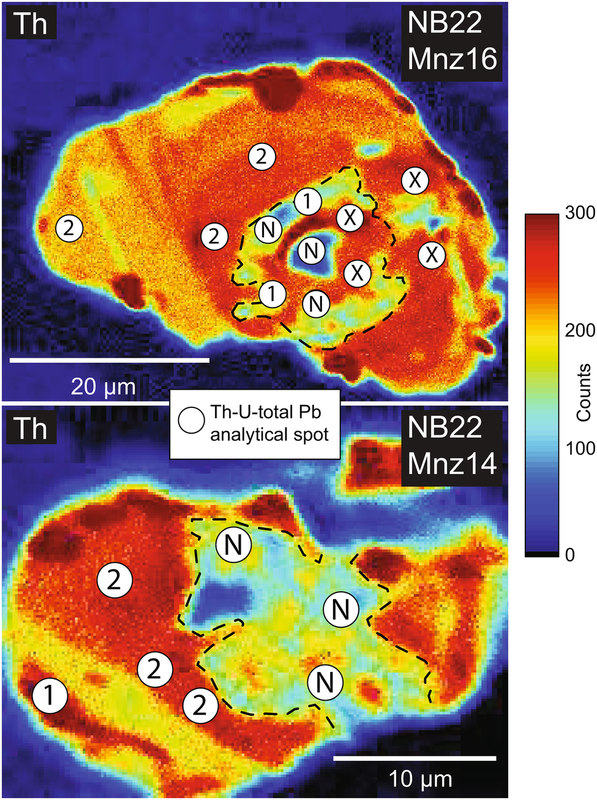 Results of monazite Th–U–total Pb dating, coupled with major and trace element mapping of monazite, revealed 603 ± 16 Ma Neoproterozoic cores surrounded by rims that formed at 498 ± 10 Ma. Monazite rim formation was facilitated via dissolution–reprecipitation of Neoproterozoic monazite. The monazite rims record garnet growth as they are depleted in Y2O3 with respect to the Neoproterozoic cores. Rims are also characterized by relatively high SrO with respect to the cores. Results of the zircon depth-profiling revealed igneous zircon cores with crystallization ages typical for SNC metasediments. Multiple zircon grains also exhibit rims formed by dissolution–reprecipitation that are defined by enrichment of light rare earth elements, U, Th, P, ± Y, and ± Sr. Rims also have subdued Eu anomalies (Eu/Eu* ≈ 0.6–1.2) with respect to the cores. The age of zircon rim formation was calculated from three metasedimentary rocks: 480 ± 22 Ma; 475 ± 26 Ma; and 479 ± 38 Ma. These results show that both monazite and zircon experienced dissolution–reprecipitation under high-pressure conditions. Caledonian monazite formed coeval with garnet growth during subduction of the Vaimok Lens, whereas zircon rim formation coincided with monazite breakdown to apatite, allanite and clinozoisite during initial exhumation. The online version of this article ( https://doi.org/10.1007/s00410-018-1539-1) contains supplementary material, which is available to authorized users. To understand the subduction–exhumation dynamics of continental lithosphere that reached (ultra-)high pressure [(U)HP] depths, we must extract information regarding the timing and conditions of prograde, peak and retrograde metamorphism. Problematically, continental lithosphere that experienced (U)HP metamorphism is commonly overprinted by exhumation-related structures and retrogressive metamorphism. Moreover, peak-temperatures of rocks that experienced (U)HP metamorphism are typically reached during decompression. Geochronometers that are sensitive to both thermally activated diffusion and deformation during exhumation can lose the record of the subduction and early exhumation processes as a result. Robust geochronometers, such as monazite and zircon, are refractory minerals that can retain their geochronological and geochemical signatures through high temperature conditions, retrogressive metamorphism and deformation (e.g. Engi 2017; Foster et al. 2000; Harley et al. 2007; Rubatto 2017; Rubatto et al. 2001; Schneider et al. 2011; Skipton et al. 2016; Walczak et al. 2017). However, monazite and zircon domains that record such important information regarding prograde metamorphism are often minute, commonly with volumes on the scale of a few micrometers. As a result, high-spatial resolution techniques must be employed to extract the critical information from the accessory minerals. Monazite electron microprobe Th–U–total Pb dating can achieve a lateral spot size of 3 µm (or less) to simultaneously gather geochronological and trace element data from monazite domains (e.g. Kohn et al. 2005; Krenn et al. 2008; Majka et al. 2012; Petrík and Konečný 2009; Pyle et al. 2005; Spear et al. 2009; Suzuki and Adachi 1991; Williams et al. 2007, 2017). Zircon depth-profiling, using either Laser Ablation Inductively Coupled Mass Spectrometry (LA–ICP–MS) or Secondary Ion Mass Spectrometry (SIMS), has proven to be a powerful technique to extract radiogenic isotopes and trace elements from micrometer-scale rims (e.g. Breeding et al. 2004; Kelly et al. 2014, 2017; Marsh and Stockli 2015; Schneider et al. 2011; Skipton et al. 2016; Woodhead et al. 2004). We applied these techniques to accessory phases hosted in the (U)HP rocks of the Seve Nappe Complex (SNC), Scandinavian Caledonides (Fig. 1), to resolve the early metamorphic evolution of these complex rocks. 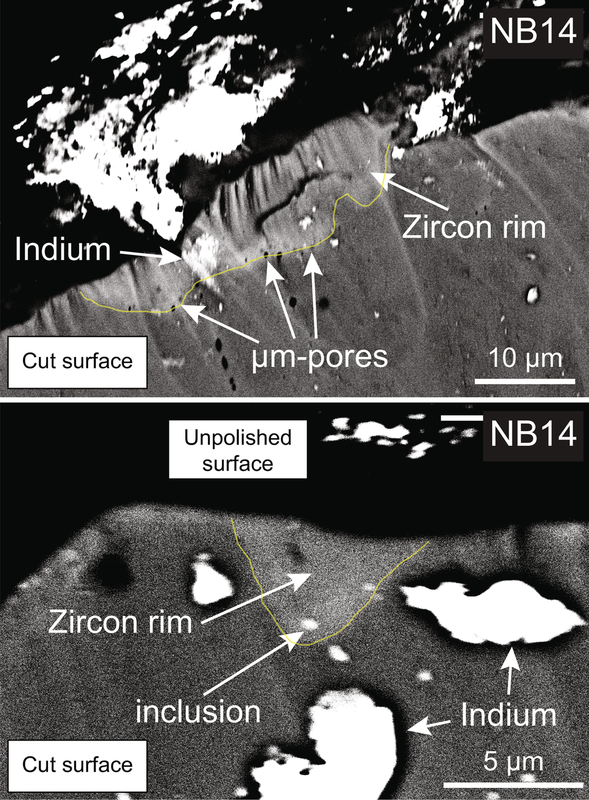 Monazite and zircon record a fluid-assisted redistribution of trace elements that documents subduction and initial exhumation in high-pressure conditions of the Vaimok Lens. 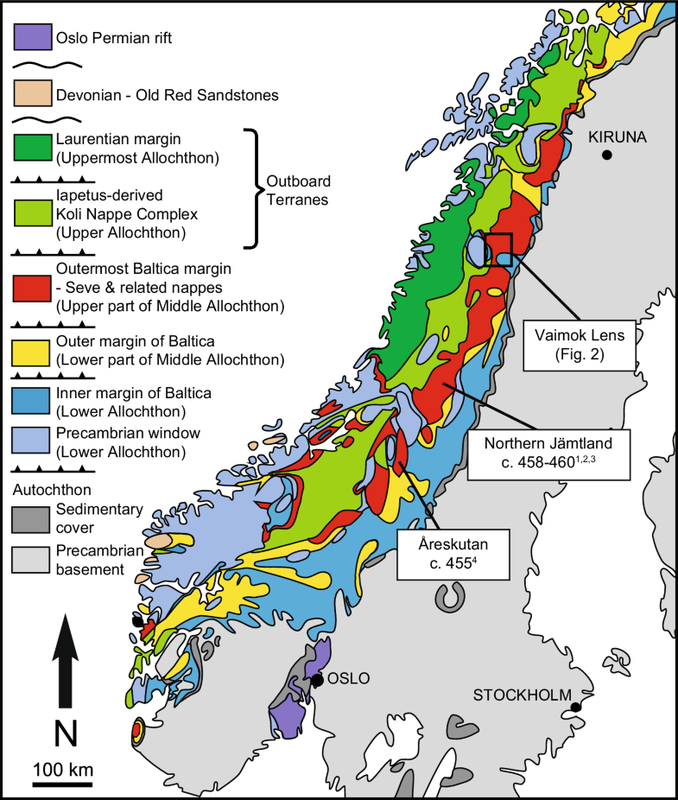 The Seve Nappe Complex (SNC) comprises rocks of the Baltica rifted passive margin that were subsequently subducted to (U)HP conditions (e.g. Albrecht 2000; Brueckner and van Roermund 2004; Bukała et al. 2018; Gilio et al. 2015; Janák et al. 2013; Klonowska et al. 2014, 2016, 2017; Kullerud et al. 1990; Majka et al. 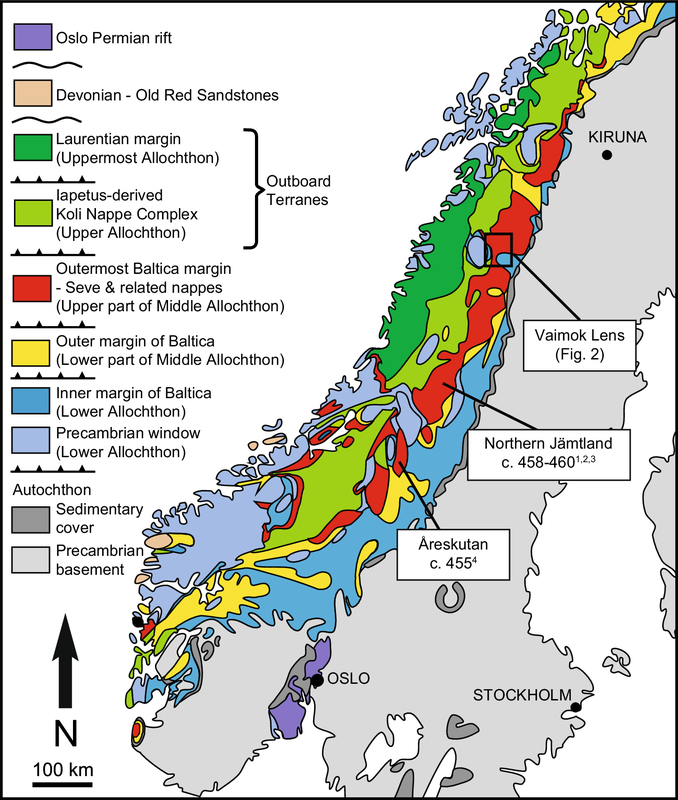 2014; Santallier 1988; Stephens and van Roermund 1984) and constitutes the upper part of the Middle Allochthon of the Scandinavian Caledonides (e.g. Gee et al. 2013). The lower part of the Middle Allochthon is similarly composed of rocks of the outer Baltica passive margin, but did not experience high-pressure metamorphism. The Middle Allochthon overlies rocks of the inner Baltica margin and allochthonous Baltica basement (Lower Allochthon) that are thrusted over autochthonous Baltica basement (Figs. 1, 2). Overlying the SNC is the Köli Nappe Complex of the Upper Allochthon (Figs. 1, 2) consisting of ophiolites, volcanic arc material and deep water sediments derived from the Iapetus Ocean (Stephens 1988). Rocks of the Laurentian margin (Uppermost Allochthon) overthrust the Köli Nappe Complex. Our study area, the Vaimok Lens (Fig. 2), comprises Neoproterozoic metasediments and felsic metavolcanic rocks hosting metamafic (eclogite) bodies (Albrecht 2000; Andréasson et al. 1985; Bukała et al. 2018; Santallier 1988). The record of prograde to peak metamorphism is nearly obliterated within the metasedimentary rocks, as they are strongly overprinted by exhumation-related deformation and retrogressive metamorphism (Albrecht 2000), the latter also affected a large portion of the eclogitic bodies. As a result, most studies investigating the metamorphic history have relied on extracting information from the few eclogitic bodies that were not strongly overprinted by retrogressive metamorphism. Recent investigation of well-preserved eclogites hosted in the metasediments yielded peak-pressure of 2.8–3.1 GPa (at ~ 700 °C) and peak-temperature of ~ 735 °C (at ~ 2.1 GPa), demonstrating that these rocks reached UHP conditions and experienced nearly isothermal decompression during exhumation (Bukała et al. 2018). Our understanding of the timing of subduction and exhumation, however, remains equivocal. Dallmeyer and Gee (1986) first published a hornblende 40Ar/39Ar age of 491 ± 8 Ma from the Vaimok Lens eclogite, interpreted to represent the age of post-eclogite facies cooling. Mørk et al. (1988) reported a garnet–omphacite Sm–Nd isochron age of 503 ± 14 Ma, and discussed it as the timing of eclogite-facies metamorphism, corroborating the results of Dallmeyer and Gee (1986). Subsequently, Essex et al. (1997) conducted titanite U–Pb geochronology from the Vaimok Lens metasediments, which yielded dates from c. 500 to c. 475 Ma. These were interpreted to represent prograde metamorphism of the Vaimok Lens, contradicting the conclusions of both Dallmeyer and Gee (1986) and Mørk et al. (1988). The most recent study to explore the timing of the metamorphic history for the Vaimok Lens reported a zircon U–Pb ID–TIMS age of 482 ± 1 Ma obtained from an unretrogressed eclogite (Root and Corfu 2012), which was taken to reflect the timing of eclogite-facies metamorphism. The latter result supports Essex et al. (1997) and suggests that extraneous 40Ar in hornblende and disequilibrium of Sm and Nd systematics in garnet were responsible for the older age estimates. Farther south in Jämtland, ages of (U)HP metamorphism are considerably younger than in the Vaimok Lens. 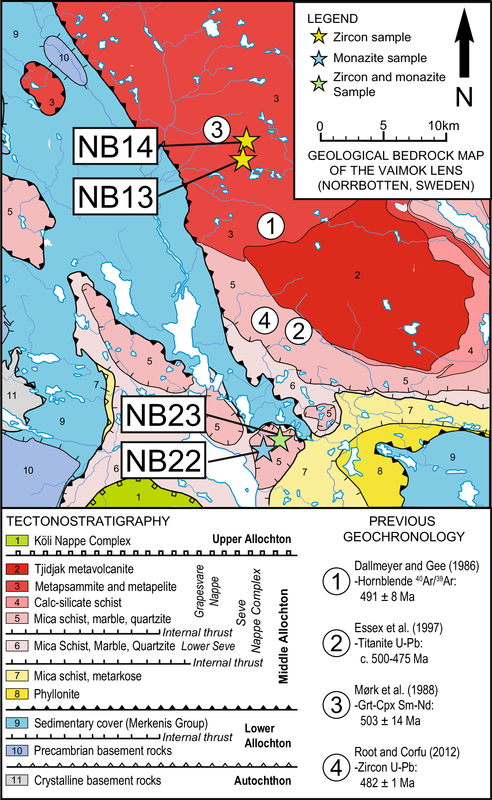 Previous geochronological studies have resolved the timing of peak-pressure metamorphism in northern Jämtland at c. 460–458 Ma (Brueckner and van Roermund 2007; Brueckner et al. 2004; Fassmer et al. 2017), and c. 455 Ma (Majka et al. 2012) for the Åreskutan locality in central Jämtland (Fig. 1). Resolving the differences between the Vaimok Lens and the Jämtland localities is crucial for understanding the dynamics of diachronous subduction of the SNC in the Vaimok Lens compared to the Jämtland localities. Four samples from the Vaimok Lens were utilized for this study (Fig. 2): two samples from the south of the area (UTM Zone 33), NB22 (metapelite; 563,607.47E, 7,377,801.66N) and NB23 (metapsammite; 563,779.35E, 7,378,240.48N), and two samples from the north, NB13 (quartzite with metapelitic laminae; 561,881.38E, 7,396,709.53N) and NB14 (metapelite; 561,553.18E, 7,396,973.67N). All the samples exhibit dominantly amphibolite-facies assemblages. Major minerals that define the rock structure in all samples include quartz, plagioclase, white mica, minor amounts of biotite or chlorite replacing white mica, and clinozoisite. Garnet is also found within the majority of the metasediments. The samples can also contain tourmaline, apatite, allanite, monazite, and zircon as accessory minerals, but are not present in all rocks. Euhedral to subhedral zircon grains were observed in thin section for samples NB13, NB14 and NB23. The clinozoisite in all samples is found as large, elongate porphyroblasts aligned to the retrogressive mineral foliation, predominantly defined by the alignment of white mica and quartz ribbons. In samples NB22 and NB23, clinozoisite forms coronas around allanite and apatite cores. In some instances, these cores also contain monazite, thus preserving the breakdown of monazite to apatite, allanite and clinozoisite (see e.g. Finger et al. 1998; Broska et al. 2005; Lo Pò et al. 2016). Similar clinozoisite coronas are found in NB13, however, any traces of monazite, apatite or allanite within the clinozoisite coronas are not observed, instead, the cores include minerals such as bastnäsite and sulphur-bearing phases. In NB14, small fragments of apatite and clinozoisite are entrained in the high-strain mica-fish structures and could represent the same reaction as in the other samples, but their original relationships are no longer preserved. Garnet is abundant within both NB22 and NB14, exhibiting only minor resorption and reaction to biotite and chlorite, respectively, at the margins of the garnet. However, geochemistry of the garnet and the mineral inclusions are significantly different for NB22 and NB14. The NB22 garnet is unzoned with respect to major cations and contains inclusions such as monazite and rutile, whereas NB14 preserves prograde growth-zoning (e.g. bell-shaped Mn-zoning; Supplementary Fig. A1) and contains inclusions of apatite and ilmenite. Unzoned garnet is not found in NB14. When considering metasedimentary samples of the Vaimok Lens obtained in the area between NB13/NB14 and NB22/NB23 locations (Supplementary Fig. A1), it is revealed that homogenized garnet is overgrown by garnet that preserves growth-zoning. In samples NB13 and NB23, small, partially resorbed garnet remnants are found within chlorite clusters. The significant resorption of the garnet renders identification of inclusions and zoning patterns to be nearly impossible. However, unlike other samples, NB23 also preserves staurolite that suggests that garnet grew along the prograde metamorphic pathway. Standard 30 µm polished thin sections cut for petrographical analysis were utilized for in-situ monazite Th–U–total Pb dating. Detection and chemical mapping of monazite was conducted using the JEOL JXA8230 electron microprobe (EMP) at AGH University of Science and Technology (Kraków, Poland) with operating conditions of 100 nA, 15 kV and a dwell time of 100 ms. Monazite grains were imaged using BSE, and wavelength-dispersive spectrometry (WDS) mapping was conducted for elements Al, Ca, Th, U, and Y, whereas energy-dispersive spectrometry (EDS) was used to measure elements Ce, Fe, La, Nd, P, and S. In-situ dating of monazite was conducted using the Th–U–total Pb method at the State Geological Institute (Bratislava, Slovakia), using a Cameca SX 100 electron microprobe and following the methodology detailed in Konečný et al. (2018). A 3 µm spot was utilized with operating conditions of 15 kV and 180 nA. Each analysis was conducted for 20 min. Analytical spots on the monazite were chosen according to both EMP chemical maps and BSE images. The chemical maps of Th and U clearly displayed the zoning of monazite, and thus were primarily used for determining the location of analytical spots (Fig. 3; Supplementary Fig. A2). The other chemical maps (i.e. P, Ca, S, Ce) were considered to ensure the targeted monazite domain was not disturbed by retrogressive breakdown to apatite and allanite. Many of the monazite fractures, voids and surface irregularities are masked in the chemical maps whereas BSE images which displayed such features. Therefore, the BSE images were consulted to avoid analyzing domains with such features. All metasedimentary samples obtained from the Vaimok Lens were crushed using a standard jaw crusher. The crushed rock was separated into three grain size fractions: > 250 µm, 250–63 µm and < 63 µm. The middle size fraction was rinsed with water then acetone, dried and a hand magnet was used to eliminate magnetic material. High-density minerals within this size fraction were separated from lighter minerals using methylene iodide (S. G. 3.3 g/cm3) in a separatory funnel. The heavy mineral fraction was then further isolated using a Frantz isodynamic separator. Zircon grains were hand-picked from the non-magnetic fraction using a binocular microscope, and were successfully extracted from samples NB13, NB14 and NB23. Zircon grains were mounted in indium within an aluminum disc, with crystal faces parallel to the mount surface and the grains were not polished. The zircon mount was imaged at AGH University of Science and Technology (Kraków, Poland) with a FEI Quanta 200 scanning electron microprobe (SEM) operating under low-vacuum conditions with a 20 kV accelerating voltage. Both back-scattered electron (BSE) and secondary electron (SE) images were acquired to detect fractures, surface overgrowths and surface abrasion or irregularities. Depth-profiling of the zircon grains was conducted at the University of New Brunswick’s LA–ICP–MS Laboratory (Fredericton, Canada), using a Resonetics S-155-LR 193 nm Excimer laser ablation system coupled to an Agilent 7700x quadrupole ICP–MS. Zircon FC-1 (U–Pb: 1099 ± 1 Ma; Paces and Miller 1993) and Plešovice zircon (U–Pb: 337.13 ± 0.37 Ma; Sláma et al. 2008) were used for geochronological reference material. NIST 610 was used as the trace element reference material. Both the geochronological and trace element references were analyzed at the beginning and end of each sample, as well as intermittently between every 3 and 6 unknowns. We utilize the laboratory protocols for U–Pb dating of zircon via LA–ICP–MS outlined by McFarlane and Luo (2012). Our method for acquiring both trace element and geochronological isotopic data involved ablating two pits on every zircon grain, each with a 33 µm lateral spot size (Supplementary Fig. A3). The ablation pits were placed adjacent to each other on the same crystal face. Careful placement of the ablation pit locations ensured that the second ablation did not intersect the previously ablation. The first ablation pit (hereafter referred to as ‘Ablation Pit 1’) used a 3 Hz repetition rate and was pulsed for a total of 206 s with a total quadrupole sweep time of 0.543 s, analyzing elements P, Ti, V, Sr, Y, Rare Earth Elements (REE), Hf, as well as U, Th and Pb isotopes. The second ablation pit (hereafter referred to as ‘Ablation Pit 2’) utilized a 2.5 Hz repetition rate and was pulsed for a total of ~ 15 s with a total quadrupole sweep time of 0.316 s, and only analyzed U, Th and Pb isotopes. The raw data from both ablation pits was reduced with Iolite v.2.5 software (Paton et al. 2011) using VisualAge data reduction scheme for geochronology (Petrus and Kamber 2012) and Trace_Element_IS for all trace elements. The first ~ 1 s of data for both Ablation Pits was discarded from analysis. Since the total pulsing time for Ablation Pit 1 was ~ 206 s, separate Iolite files were produced for each 30 s interval of the ablation (i.e. 0–30 s, 30–60 s, 60–90 s, etc.). This enabled us to detect small variations in trace elements and U–Pb dates over a long total ablation time. As well, sub-dividing the long ablation time resulted in more accurate downhole fractionation corrections for each 30 s interval, as opposed to a single downhole fractionation correction for the entire ablation time. Both standards and unknowns were processed in the same way. To expose the interior of the zircon, select grains were extracted from the indium mount and re-mounted in a new mount with up to 3 aligned zircon grains. The grains were cut using a Hitachi IM4000Plus argon ion milling system. Specimens to be cut were positioned in a hollow aluminum holder filled with the soft indium metal. A mask was aligned with the zircon grains such that the edge of the mask was aligned along the ablation pits of the zircon. The parts of the zircon grains not covered by the mask were removed by the ion beam operated at 6 kV. As a result, zircon grains were cut in half, parallel to the depth-profiles. Cut zircon grains were gold-coated and then imaged at the Swedish Museum of Natural History using an FEI Quanta 650FEG-SEM operated at 15 kV to investigate chemical domains of the zircon interiors. Standard 30 µm polished thin sections were utilized for Zr-in-Rutile thermometry (Zack et al. 2004; Tomkins et al. 2007). Rutile inclusions within garnet were targeted for this method. Analyses were conducted at AGH University of Science and Technology (Kraków, Poland), using a JEOL JXA8230 electron microprobe. The analytical procedure followed the protocol of Bukała et al. (2018) and utilized a 1 µm spot was utilized for WDS with operating conditions of 15 kV and 120 nA. In total, we conducted 93 analyses on monazite from two samples according to different domains primarily defined by Th and U concentrations. Twenty-eight of the analyses were discarded due to anomalous chemistry (i.e. low P2O5, high FeO, oxide wt % totals > 102). Of the accepted 65 analyses, 49 were from NB22 and 16 from NB23. Primary discrimination according to the Th–U–total Pb dates for the samples shows that eight analyses for NB22 and three analyses for NB23 yielded Neoproterozoic dates (c. 573–667 Ma) whereas 41 analyses for NB22 and 13 analyses for NB23 yielded Cambrian–Ordovician dates (c. 479–536 Ma; Fig. 4; Supplementary Table A1). Neoproterozoic dates were obtained in the central part of monazite grains defining ‘cores’ relatively lower in Th and U, whereas the relatively higher Th and U domains that surrounded the cores yielded Cambrian/Ordovician domains. The boundary between the two groups is irregular and lobate (Fig. 3). To discriminate different chemical groups of Cambrian–Ordovician monazite, and to evaluate the Cambrian–Ordovician domains with respect to the Neoproterozoic ones, we used Date vs. Y2O3 and SrO vs. ThO2 discrimination plots (Fig. 4). For both samples, the Neoproterozoic analyses are between 0.43 and 1.20 Y2O3 wt% (mean 0.70) with the exception of two outliers (2.10 and 2.80 Y2O3 wt%). The Cambrian–Ordovician analyses can be further subdivided based on Y2O3 wt%. For both samples, Group 1 is similar to the Neoproterozoic domains with 0.51–1.62 Y2O3 wt% (mean 0.98), whereas Group 2 is defined by < 0.35 Y2O3 wt% (mean 0.18). The subordinate Group 3 contains between 2.93 and 3.14 Y2O3 wt% (mean 3.03). Neoproterozoic analyses are between 0.95 and 5.08 ThO2 wt% (mean 2.78) and 0.05–0.32 UO2 wt% (mean 0.16), Group 1 between 0.86 and 4.38 ThO2 wt% (mean 2.62) and 0.25–0.37 UO2 wt % (mean 0.26), and Group 2 yields elevated values of 4.24–7.71 ThO2 wt% (mean 5.27) with one outlier at 1.77, and 0.28–0.59 UO2 wt% (mean 0.46). Examination of the analytical spot spatial distribution reveals that Group 1 domains reside near the margins of the Neoproterozoic domains, whereas Group 2 are distal (Fig. 3). The Neoproterozoic analyses yielded 0.01–0.42 SrO wt% (mean 0.18; Fig. 4). Group 1 is similar to the Neoproterozoic with values of 0.02–0.44 SrO wt% (mean 0.16). Group 2 values are 0.05–0.79 SrO wt% (mean 0.35) showing overall higher values than the Neoproterozoic and Group 1 domains (Fig. 4). Group 3 cluster between 0.02 and 0.03 wt% (mean 0.03). Due to the similar geochemical traits of the monazite domains from NB22 and NB23 (Fig. 4), and the fact that the samples NB22 and NB23 were collected a few 100 m apart (Fig. 2), we grouped the results from both samples to calculate our monazite ages. The weighted average of the older population is 603 ± 16 Ma (n: 11, MSWD: 1.10). The weighted averages for the Cambrian–Ordovician Group 1, Group 2 and Group 3 dates are 502 ± 15 Ma (n: 11 MSWD: 0.74) and 498 ± 10 Ma (n: 39, MSWD: 0.48), and 479 ± 29 Ma (n: 4, MSWD: 0.43), respectively. Errors are reported according to the internal errors calculated with the weighted mean (if > 2% of weighted mean) or with a minimum error of 2% of the weighted mean (if calculated internal error is < 2%), according to Spear et al. (2009). A total of 231 zircon grains (NB13, n: 62; NB14, n: 87; NB23, n: 82) were picked on the basis of size and shape, that were devoid of fractures, and were not heavily abraded or contained visible inclusions. Back-scattered electron images revealed that the majority of zircon grains from the three samples exhibited euhedral crystal faces with sharp edges. Some zircon grains were slightly rounded, but crystal faces could still be observed. The surfaces of NB13 zircon are observed to be very smooth with little surface irregularities and very minor outgrowths The surfaces of NB23 and NB14 varied from smooth to very mottled and irregular (Supplementary Fig. A4). Overall, fracturing was not a prominent feature for the grains of all samples; only few grains displayed moderate–heavy fracturing. Zircon grains for all samples were typically 100–200 µm in length with 2:1 or 3:1 aspect ratios. Back-scattered electron images of zircon cross sections, cut parallel to the depth-profile pits, show thin, discontinuous, concave-inwards, BSE-bright (corresponding to CL-dark) zones at the surface of the crystal (Fig. 5). The margins of BSE-bright zones appear to be associated with µm-scale pores in the zircon grain. Minor inclusions have been identified within the BSE-bright zones. Results of Ablation Pit 1 were plotted as concentration profiles with respect to ablation time (Fig. 6) to reveal inclusions, define possible rims, and geochemically characterize the cores. Zircon cores from the results of Ablation Pit 1 were defined by flat trace element profiles that extend across the majority of the depth-profile. Inclusions and fractures could be identified based on chemical anomalies and oscillations in the trace element plateaus (Fig. 6). 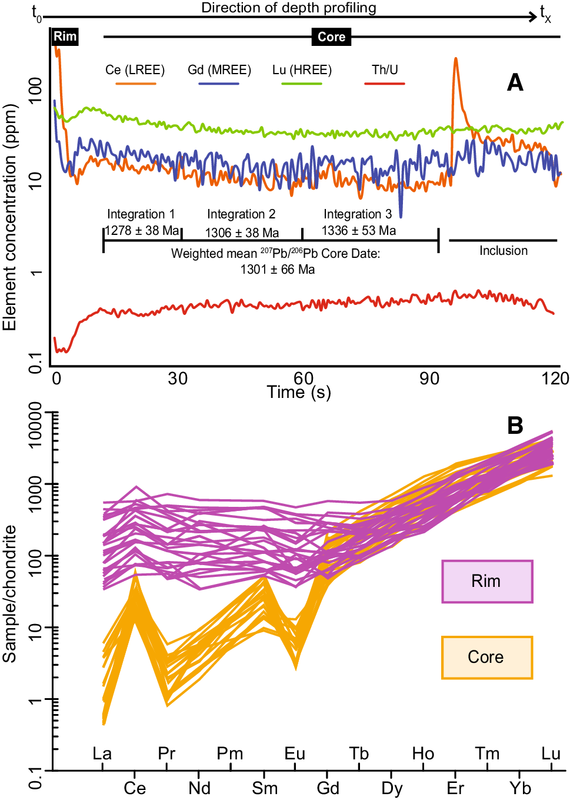 Ideally, four ~ 30 s integrations were made for the zircon core (spanning ~ 0 to 120 s), but the amount of inclusions or fractures intersected by the depth-profile sometimes dictated less integrations or integrations defined for < 30 s. The integrations were limited to the ≤ 120 s of the profile to ensure that integrations strictly defined the zircon core and did not include the opposing zircon rim, if present. A weighted average of the 207Pb/206Pb ages was calculated from the collective integrations for a single zircon core (Fig. 6). Dates for the cores were not corrected for 204Pb as this frequently produced reversely-discordant dates. The results from NB13 (Fig. 7) revealed the majority of the zircon cores yielded 207Pb/206Pb dates of c. 990–1240 Ma (n: 47), a subordinate population between c. 1301 and 1486 Ma (n: 11), and scattered dates from c. 1656 to 2635 Ma (n: 4). For NB14, a similar signature is revealed with a cluster at c. 887–1229 Ma (n: 51), and a secondary population in the range of c. 1340–1764 Ma (n: 35). Lastly, NB23 yielded a relative continuum between c. 874 and c. 1883 Ma (n: 70), with isolated dates between c. 2135 and c. 3481 Ma (n: 5). Numerous zircon grains possess geochemically distinct rims with a total of 109 out of 231 zircon grains (NB13, n: 29; NB14, n: 47; NB23, n: 33) exhibiting LREE enrichment within the first 1–7 s of the ablation (Fig. 6; Supplementary Table A2a,b,c). The LREE are observed to be enriched up to ~ 600 ppm in the rims and have smaller Eu anomalies (Eu/Eu* ≈ 0.6–1.2; Eu/Eu*= EuN/[√SmN × GdN]) than the cores (Fig. 6). In the LREE enriched rims, HREE were slightly elevated by up to 100 ppm (Lu; NB13, n: 20; NB14, n: 23; NB23, n: 21), equal to (NB13, n: 9; NB14, n: 22; NB23, n: 8), or slightly depleted by up to ~ 100 ppm (Lu; NB13, n: 0; NB14, n: 2; NB23, n: 4) relative to core values. Enrichment of Th and U (corresponding to lower Th/U ratios), P, Y, and Sr are observed for LREE enriched rims, except for NB13 which does not show a coincident increase in P. Enrichment of Ti in the grain margins is also observed, but does not necessarily correspond to LREE enrichment. A minor amount of grains showed LREE depletion (NB13, n: 12; NB14, n: 9; NB23 n: 11) relative to core values. The remaining grains showed no change in LREE or HREE in the margins of the grains, or other distinct patterns were not distinguishable based on the trace element profiles. Zircon rim dates were defined from analyses of Ablation Pit 2, according to 206Pb/238U and Th/U ratios (Supplementary Table A3), the decrease of the latter correlates to the enrichment of LREE observed in the trace element concentration profiles from Ablation Pit 1. In accordance with previous depth-profiling studies (March and Stocki 2015; Kelly et al. 2017; Skipton et al. 2016), we utilized the Wetherill Concordia diagram to plot our rim integrations. However, in contrast to these studies (i.e. Kelly et al. 2017; Skipton et al. 2016) we did not apply a 204Pb/206Pb cut-off for screening the data as the uncertainties of the ratio often equalled the reported value, thus this cut-off method was deemed unreliable for our data. Instead, we applied the 204Pb-correction built into VisualAge data reduction scheme (Petrus and Kamber 2012) to all rim integrations. Corrected rim integrations that had reverse discordance were discarded and the uncorrected integration was instead accepted at the > 70% concordance level. This approach defined a broad cluster of zircon dates with variable discordance in Wetherill Concordia space, ranging from 70 to 99%. Zircon from metasedimentary rocks are likely detrital and possess a spectrum of ages that represent the provenance of the sediment, which is corroborated by the core ages reported here. In a simple binary mixing model, calculating a single regression line from an individual core-rim analysis pair would produce a single lower-intercept and a single upper-intercept, defining the rim formation and the initial crystallization of the zircon, respectively. However, this approach is not able to capture the entire distribution of detrital core ages with a single upper-intercept, in turn biasing the calculated lower-intercept. To fully represent the entire range of zircon core ages and prevent such biasing, we developed a new method for discordance regression. The method involves calculation of a single discordance regression line for every core-rim pair in Wetherill Concordia space (Fig. 8) using the core integrations from Ablation Pit 1 and the rim integrations from Ablation Pit 2. We assume that the isotopic ratios for the zircon cores obtained from Ablation Pit 1 represent the starting isotopic ratios for the zircon rims, analyzed in Ablation Pit 2, prior to rim formation. We then fixed the upper intercept in Wetherill Concordia space for every regression of each individual grain using the core dates. Plotting core dates in Wetherill Concordia required the accurate representation of the 207Pb/206Pb core isotopic ratios as 206Pb/238U and 207Pb/235U isotopic ratios in Wetherill Concordia space. To achieve this, the discordance of 207Pb/206Pb vs. 206Pb/238U and 207Pb/206Pb vs. 207Pb/235U ratios was calculated for every individual core integration for each zircon grain (up to four integrations per zircon core; Supplementary Table A3). Only integrations that had < 12% normal or < 6% reverse discordance were accepted, preventing large discrepancies between isotopic ratios to propagate into the fixed upper intercept. A weighted average of the 206Pb/238U and 207Pb/235U ratios for the accepted integrations of each zircon grain was calculated so that the 207Pb/206Pb core ages were appropriately represented in Wetherill Concordia space. The 206Pb/238U and 207Pb/235U isotopic ratios for the rim analyses were obtained directly from the analyses of Ablation Pit 2. A single regression for each zircon grain was then performed from its fixed upper intercept through the rim analysis. The upper intercept for every core-rim pair was checked against the calculated 207Pb/206Pb core age for that same zircon (Supplementary Table A4). This ensured that the 207Pb/206Pb, 206Pb/238U, and 207Pb/235U isotopic ratios all calculated ages that are indistinguishable within error, and therefore, the lower intercept was not biased by an incorrect upper intercept. The method is not affected by discordant core ellipses as long as the upper intercept matches the 207Pb/206Pb date of the core, but the errors of the core integrations are still accounted for in the lower-intercept. A weighted average of the lower intercepts for each sample was then calculated to resolve the timing of zircon rim development. The weighted averages of the lower intercepts are: 480 ± 22 (NB13, n: 26, MSWD: 1.3); 475 ± 26 Ma (NB14, n: 38, MSWD: 1.15); and 477 ± 39 (NB23, n: 21, MSWD: 0.75) (Fig. 8). Zircon rims were utilized for Ti-in-Zrn thermometry, using the calibration of Ferry and Watson (2007). The concentrations of Ti (ppm) were obtained using Iolite software. Integrations of rims and core were defined for every grain. Grains that had rims with anomalously high Ti concentrations (often exceeding 100 ppm) were discarded to avoid the influence of inclusions or fractures. Additionally, grains with Ti concentrations in the rims that were indistinguishable from the core values were also not considered for calculation of Ti-in-Zrn temperatures. The integrated concentrations of rim analyses ranged from 12 to 23 ppm for all samples, whereas cores ranged from 3 to 13 ppm (Supplementary Table A5). These concentrations correspond to 695–875 °C (NB13, n: 18), 707–890 °C (NB14, n: 19), 693–892 °C (NB23, n: 28). The temperature ranges incorporate both the uncertainty of the calibration and the uncertainty of the rim Ti concentrations. Thirteen analyses were conducted on rutile inclusions in garnet in sample NB22. The concentration of Zr ranges from 78 ppm to 263 ppm with an average of 150 ppm (Table A6). Temperatures were calculated according to the pressure-dependent calibration of Tomkins et al. (2007). Average temperatures (determined for different pressures) are 594 °C (10 kbar), 614 °C (15 kbar) and 635 °C (20 kbar). We assign an uncertainty of ± 30 °C for the reported values according to the uncertainties discussed by Tomkins et al. (2007). Monazite exhibits four distinct populations based on Th–U–total Pb and geochemical traits (Fig. 4; Supplementary Table A1). The textural relationships of the Neoproterozoic, Group 1 and Group 2 monazite are typical dissolution–reprecipitation features (Fig. 3) as demonstrated by many natural examples (e.g. Finger and Krenn 2007; Holder et al. 2015; Kohn et al. 2005; Williams et al. 2011) and laboratory experiments (e.g. Budzyń et al. 2011, 2017; Harlov et al. 2011; Seydoux-Guillaume et al. 2012; Shazia et al. 2015). No relationship between Group 3 and the other monazite populations are observed. The Neoproterozoic monazite yields a weighted average of 603 ± 16 Ma that lies within the range of previous geochronological studies calculating the timing of dyke swarm emplacement, protoliths to eclogite in the Vaimok Lens (Albrecht 2000), at 607 ± 2 Ma (Root and Corfu 2012) and 608 ± 1 Ma in the Sarek Lens (Svenningsen 2001), the latter located ~ 100 km northeast from our field area. Therefore, from a geochronological standpoint, this monazite may be related to contact metamorphism caused by the emplacement of mafic dykes. However, the patchy zoning texture of the Neoproterozoic domains may indicate partial dissolution of these domains, and the Neoproterozoic Th–U–total Pb dates may reflect an older crystallization age that was partially reset. As a result, the interpretation of the Neoproterozoic monazite remains equivocal. Neoproterozoic domains are delimited by a distinct, lobate boundary. The Group 1 analyses are typically located proximal to this boundary, where preserved. Trace elements of Group 1 monazite are indistinguishable from the Neoproterozoic monazite, however, the Group 1 weighted average age of 502 ± 15 Ma demonstrates Pb-loss during probable dissolution–reprecipitation. Dissolution–reprecipitation of monazite progresses from the grain boundary inwards (Harlov et al. 2011) therefore, it is plausible that the Group 1 domains represent the final stage of dissolution–reprecipitation when Pb was expelled yet the geochemical composition of the Neoproterozoic domains remained. However, the proximity of the Group 1 analytical spots to the Neoproterozoic domains suggests a degree of analytical mixing for the Group 1 results. It is also possible that Neoproterozoic domains were incompletely dissolved adjacent to the dissolution–reprecipitation interface and remain within the Group 1 domains (Seydoux-Guillaume et al. 2018; Williams et al. 2011). Therefore, we do not attach any geological significance to the Group 1 age of 502 ± 15 Ma. Dissolution of Neoproterozoic monazite and reprecipitation to form the Group 2 monazite occurred at 498 ± 10 Ma. The decrease in Y2O3 observed for the Group 2 domains with respect to the Neoproterozoic domains (Fig. 4) demonstrates that garnet was growing in the rock simultaneous to the dissolution–reprecipitation of monazite (e.g. Foster et al. 2000, 2002; Kohn et al. 2005; Rubatto et al. 2013). This is supported by the inclusions of monazite (within garnet) that record a Caledonian Th–U–total Pb signature. The calculated temperature of 594 ± 30 °C resulting from Zr-in-Rt thermometry (Tomkins et al. 2007; Zack et al. 2004) conducted on rutile inclusions in garnet provides a minimum temperature estimate for garnet growth in the metasediments. Furthermore, the overall elevated SrO (wt%) in the Group 2 domains compared to the Neoproterozoic suggests that Sr was liberated at the same time as monazite reprecipitation, indicating instability of plagioclase during garnet growth and dissolution–reprecipitation of the monazite (Finger and Krenn 2007; Holder et al. 2015; Krenn and Finger 2004). The broad range of SrO values could reflect that the availability of SrO incorporated in monazite was variable through time, or that SrO incorporation into monazite was controlled by local availability on the grain-scale. Nevertheless, the instability of plagioclase is an indication that dissolution–reprecipitation likely occurred under high-pressure conditions (Finger and Krenn 2007; Holder et al. 2015; Krenn and Finger 2004). A degree of uncertainty exists regarding the confidence of the weighted average ages reported for Group 2 as the Th–U–total Pb dating method cannot distinguish common-Pb. Holder et al. 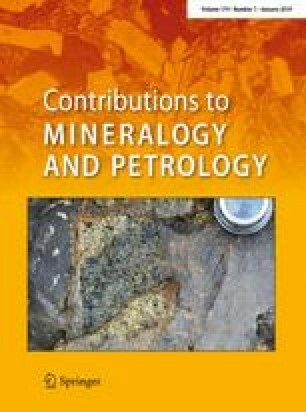 (2015) revealed significant concentrations of common-Pb in monazite which formed via dissolution–reprecipitation of older monazite in UHP conditions. To add further uncertainty, dissolution–reprecipitation experiments coupled with transmission electron microscopy have revealed relic, nano-scale domains of older monazite preserved in the younger, reprecipitated monazite (Seydoux-Guillaume et al. 2018). Monazite that grows in sub-UHP conditions, however, typically has little to no incorporation of common-Pb (Montel et al. 1996). Furthermore, if µm–nm-scale domains of Neoproterozoic material persisted within the reprecipitated monazite domain, we should expect such mixing to be reflected not only in the Th–U–total Pb signature but also in chemistry. The clear distinction between the Neoproterozoic and Group 2 monazite with respect to Y2O3, ThO2, UO2, and SrO content (Fig. 4) implies that there is probably an insignificant volume of Neoproterozoic monazite, if any, that was incorporated in the reprecipitated domain. We are confident that the weighted average age of 498 ± 10 Ma represents the timing of prograde metamorphism of the southern area of the Vaimok Lens because the reprecipitated monazite records prograde garnet growth in the metasediments, reaching high-pressure conditions and previous geochronology constrained eclogite-facies metamorphism at 482 ± 1 Ma (Root and Corfu 2012). All four of the analytical points that recorded Group 3 monazite chemistry were located on a single grain. No spatial relationships are recognized with Neoproterozoic/Group 1 and 2 monazite providing no indication that Group 3 formed via dissolution–reprecipitation of a previous monazite volume. Group 3 domains are distinctly higher in Y2O3 (wt%) than any of the other groups (Fig. 4). This elevated Y2O3 content would suggest new monazite growth during partial garnet dissolution (e.g. Foster and Parrish 2003; Kelly et al. 2006; Mahan et al. 2006; McFarlane et al. 2005). Xenocrystic zircon cores analyzed in this study preserve REE patterns typical for igneous zircon (Hoskin and Ireland 2000; Hoskin and Schaltegger 2001) and their integrated U–Pb dates range from Neoproterozoic to Paleoproterozoic with minor Archean input for all samples (Fig. 7), strongly indicative of detrital populations. The 207Pb/206Pb detrital zircon spectra for each sample highlight patterns that are typical for sediments of the Grapesvare Nappe (SNC; Fig. 2) and associated nappes (see Gee et al. 2015). Back-scattered electron images of zircon cross-sections reveal concave-inwards BSE-bright zones coupled with µm-scale pores, typical for dissolution–reprecipitation structures of zircon (Fig. 5; Geisler et al. 2007; Harley et al. 2007; Putnis 2009; Rubatto et al. 2008). The majority of zircon rims from the Vaimok Lens show enrichments in trace elements with respect to the zircon core. The rims of all samples are enriched in LREE, U, Th (Fig. 6). Samples NB14 and NB23 also show coupled enrichment in P, Sr, and Y. Whereas U, Th, and P can be incorporated in zircon, LREE do not fit into the zircon crystal structure and enrichment could reflect µm–nm-scale inclusions in the zircon rims (Geisler et al. 2007). Weighted averages of the lower-intercepts derived from discordance regression of zircon rim-core pairs yield ages of 480 ± 22 (NB13), 475 ± 26 Ma (NB14), and 477 ± 39 (NB23), interpreted as the ages of zircon rim dissolution–reprecipitation (Fig. 8). However, the significant uncertainty of the 204Pb measurement applied to the 204Pb-correction propagated into the lower-intercept weighted averages. The uncertainty encompasses much of the timescale of subduction and prograde metamorphism, to peak metamorphism (482 ± 1 Ma; Root and Corfu 2012), and exhumation/retrogression of the Vaimok Lens. As a result, the geochronological results must be interpreted in conjunction with the geochemistry of the zircon rims to reveal at which stage of the subduction–exhumation cycle the dissolution–reprecipitation of the zircon rims occurred. The elements incorporated into the zircon rims (LREE, P, Th, U, ± Y, ± Sr) strongly resemble the chemistry of monazite. This suggests that dissolution–reprecipitation of the zircon rims is connected to physiochemical processes affecting monazite, as either (1) dissolution–reprecipitation of monazite during subduction; or (2) breakdown of monazite to form apatite, allanite and clinozoisite during exhumation. Coupled dissolution–reprecipitation of monazite and zircon in our rocks could be a plausible means of liberating trace elements from monazite and uptaking them into the zircon rims. The dissolution–reprecipitation of monazite in our rocks records the growth of garnet (i.e. depletion in Y2O3 with respect to the Neoproterozoic cores). If dissolution–reprecipitation of zircon rims was coeval with this monazite recrystallization, then the zircon rims should be depleted in HREE as the growth of garnet sequesters HREE (Bingen et al. 2004; Hermann and Rubatto 2003; Kohn and Kelly 2018; Rubatto 2002, 2017; Rubatto and Hermann 2007; Whitehouse and Platt 2003). However, zircon rims show little to no change in HREE content (Fig. 6; Supplementary Table A2) suggesting that the zircon rims did not form during garnet growth, and therefore, are likely not related to dissolution–reprecipitation of monazite. The alternative is that monazite breakdown to form apatite, allanite and clinozoisite supplied the trace elements that were incorporated in the zircon rims (Fig. 9). Both prograde (low Y2O3 monazite) and retrograde monazite (high Y2O3) experienced such reaction with the clinozoisite coronas typically aligned parallel to the retrogressive ‘S2 foliation’ (Albrecht 2000). Furthermore, results of Ti-in-Zrn thermometry indicate that zircon rims formed in temperatures > 700 °C, whereas the low-Eu anomalies of the rims (with respect to the cores) indicate rim formation under high-pressure conditions (Bingen et al. 2004; Kohn and Kelly 2018; Rubatto 2002, 2017; Rubatto and Hermann 2007; Whitehouse and Platt 2003). These conditions are comparable to peak temperatures of ~ 735 °C (at 2.1 GPa) experienced by the Vaimok Lens eclogite assemblages during decompression (i.e. the E3 stage of Bukała et al. 2018). The E3 stage of Bukała et al. (2018) records an influx of Ca-rich fluid into the Vaimok Lens, which could catalyze monazite breakdown to apatite, allanite and clinozoisite (Budzyń et al. 2011). Dissolution–reprecipitation of zircon rims was likely facilitated by this Ca-rich fluid and was coeval with the breakdown of monazite to apatite, allanite and clinozoisite during initial exhumation of the Vaimok Lens. The robust nature of both monazite and zircon geochronometers allowed for the preservation of the timing record of subduction and initial exhumation of the Vaimok Lens (Fig. 9). Monazite with a Neoproterozoic Th–U–total Pb signature and Neoproterozoic to Archean igneous zircon grains were able to survive through Caledonian subduction and associated prograde metamorphism, attaining high-pressure conditions. The survival of zircon through such conditions is typical, whereas natural, experimental and numerical studies predict that monazite should react to form allanite in medium-grade conditions (e.g. Budzyń et al. 2011; Janots et al. 2007; Smith and Barreiro 1990; Spear 2010; Wing et al. 2003). In the rocks from the Vaimok Lens, there is no evidence for the existence of prograde allanite and Neoproterozoic monazite is observed to be the direct precursor of the reprecipitated high-pressure Cambrian monazite. Previous studies of natural samples have also reported similar observations for monazite (e.g. Finger and Krenn 2007; Holder et al. 2015; Kohn et al. 2005; Lo Pò et al. 2016; Petrík and Konečný 2009; Williams et al. 2011) indicating that high-pressure monazite does not always require an allanite precursor, which may be instead controlled by bulk rock composition (Spear 2010). We consider that the Neoproterozoic monazite remained (meta)stable in the Vaimok Lens metasediments until the initiation of the garnet growth reactions. Fluids that possibly originated due to this reaction may have triggered the dissolution of the metastable Neoproterozoic monazite and reprecipitated new monazite at 498 ± 10 Ma (Fig. 9). The stable, reprecipitated monazite recorded both garnet growth (decrease of Y2O3) and high-pressure conditions (increase of SrO). The high-pressure conditions coupled with the minimum temperature of garnet growth at 594 ± 30 °C suggests that the metasedimentary rocks of the Vaimok Lens underwent a similar P–T path as the eclogites they are hosting. Peak-pressure metamorphism for the Vaimok Lens of 2.8–3.1 GPa at ~ 700 °C (Bukała et al. 2018) was attained at 482 ± 1 Ma (Root and Corfu 2012). The reprecipitated Caledonian monazite (Group 2) remained undisturbed through peak-pressure metamorphism. Minor monazite growth (Group 3) occurred during initial decompression dissolution of garnet at 479 ± 29 Ma. As exhumation continued, peak temperature conditions of ~ 2.1 GPa at ~ 735 °C (Bukała et al. 2018) were attained, coinciding with the influx of Ca-rich fluids into the Vaimok Lens, likely from the underlying continental rocks that were still subducting and undergoing devolatilization (Bukała et al. 2018). Until this point, monazite was a stable phase in the metasediments, however, the influx of Ca-rich fluid destabilized monazite, aiding the formation apatite, allanite and clinozoisite. This reaction has previously been documented in high-pressure rocks (Gabudianu Radulescu et al. 2009) and during decompression (Lo Pò et al. 2016). The destabilization of monazite in the Vaimok Lens metasediments is recorded in the reprecipitated zircon rims that formed at 480 ± 22 (NB13), 475 ± 26 Ma (NB14), and 477 ± 39 (NB23). The Eu-anomalies of the zircon rims indicate dissolution–reprecipitation of the xenocrystic cores occurred under high-pressure conditions and temperatures > 700 °C (Fig. 9), similar to the stage-E3 conditions of Bukała et al. (2018). The new geochronological results are consistent with the c. 482 Ma timing of eclogite-facies metamorphism (Root and Corfu 2012) and strengthen the interpretations of Essex et al. (1997) that prograde metamorphism (i.e. subduction) occurred in the late Cambrian in the Vaimok Lens. Our results together with the results of Root and Corfu (2012) indicate that previously reported dates documenting peak metamorphism at 503 ± 14 Ma (Mørk et al. 1988) followed by exhumation at 491 ± 8 Ma (Dallmeyer and Gee 1986) do not represent the timing of subduction–exhumation for the Vaimok Lens. With these new results, the prograde to peak metamorphic history of the Vaimok Lens is better resolved, and is clearly older than peak-pressure metamorphism farther south in Jämtland at c. 458–460 Ma (Brueckner and van Roermund 2007; Brueckner et al. 2004; Fassmer et al. 2017; Majka et al. 2012). Furthermore, the monazite ages documenting subduction are similar to previous studies of arc volcanism in the Köli Nappe (Upper Allochthon) at 492 ± 1 Ma (Claesson et al. 1988) and 488 ± 5 Ma (Claesson et al. 1983), providing a direct geochronological link between subduction of the SNC and arc-volcanism in the overriding plate (Köli Nappe). 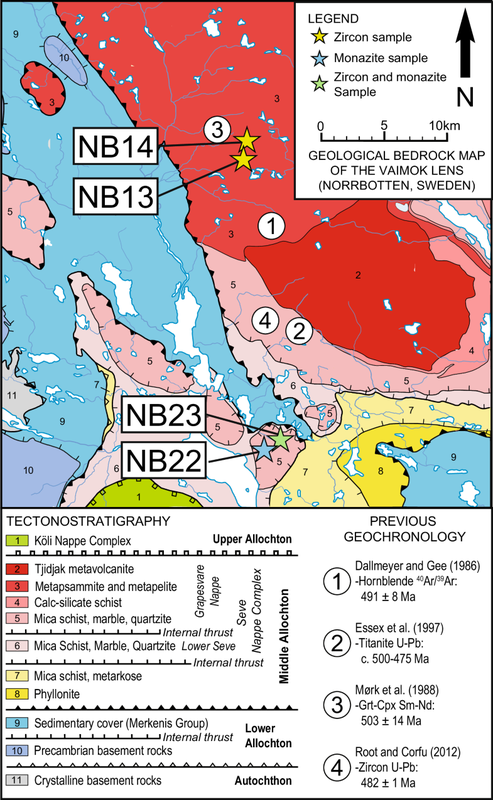 The results of the decompressional growth of monazite domains and zircon rims indicate that exhumation of the Vaimok Lens likely initiated before peak-pressure metamorphism was realized further south in Jämtland. The non-synchronicity of the timing of subduction along the SNC is an indication that the geometry of the subduction zone was complex along strike of the orogeny. This leads to several possibilities to explain late Cambrian subduction of the Vaimok Lens, including: (1) a separate subduction zone for the Vaimok Lens than the subduction system recorded further south in Jämtland, (2) the Vaimok Lens represents the introduction of a continental crust promontory into the subduction zone (e.g. Bukała et al. 2018), or (3) a “zipper-geometry” for introduction of continental crust into the subduction zone (akin to subduction under the Sunda-Banda Arc; e.g. Harris 2011; Hamilton 1979), with continental crust introduced progressively from north to south. To resolve these possible models, further geochronological studies need to focus on SNC subduction–exhumation processes, especially with attention to the understudied, northern SNC localities. Nevertheless, the results of this study build a foundation for understanding the dynamics of SNC subduction along strike of the orogen. We report new monazite and zircon geochemistry and geochronology that records high-pressure subduction and exhumation of the Vaimok Lens metasediments, following a similar P–T path as the eclogitic bodies that they host. Dissolution–reprecipitation of monazite at 498 ± 10 Ma records garnet growth in high-pressure conditions at > 560 °C. The monazite preserved their prograde record through subsequent eclogite facies (2.6–2.7 GPa and 680–780 °C), retrogressive metamorphism and associated deformation. Minor monazite growth contemporaneous with incipient exhumation occurred at 479 ± 29 Ma, related to decompression-related dissolution of garnet. As exhumation proceeded, an influx of Ca-rich fluids into the metasediments destabilized monazite, causing it to decompose to apatite, allanite and clinozoisite and facilitate dissolution–reprecipitation of zircon rims. Zircon rim formation recording monazite-breakdown occurred in high-pressure conditions and in temperatures > 690 °C. The interplay between prograde and retrograde metamorphic reactions, and re-distribution of trace elements coupled with dissolution–reprecipitation of accessory phases illustrates the importance of understanding trace element distribution dynamics to record metamorphic events. These results also demonstrate that the application of high spatial resolution techniques applied to accessory minerals (i.e. in situ monazite geochronology and zircon depth-profiling) can successfully extract reliable and consistent geological histories from mineral volumes on the few µm-scale. This study was funded by the National Science Centre, Poland (CALSUB Project no. 2014/14/E/ST10/00321). We would like to thank Chris McFarlane (University of New Brunswick) for assistance in the laboratory for zircon depth-profiling. Brandon Boucher (University of New Brunswick) is especially thanked for his time, effort and patience in dealing with managing and organization of the zircon data, and for teaching the ways of the Iolite software. We would also like to thank Patrik Konečný for his assistance in the laboratory for Th–U–total Pb dating of monazite. Adam Włodek is thanked for helping with the electron microprobe investigations. Daniela Rubatto is gratefully thanked for her editorial handling and comments. We also thank Chris Mattinson and Robert Holder for their reviews, comments, and constructive criticisms.